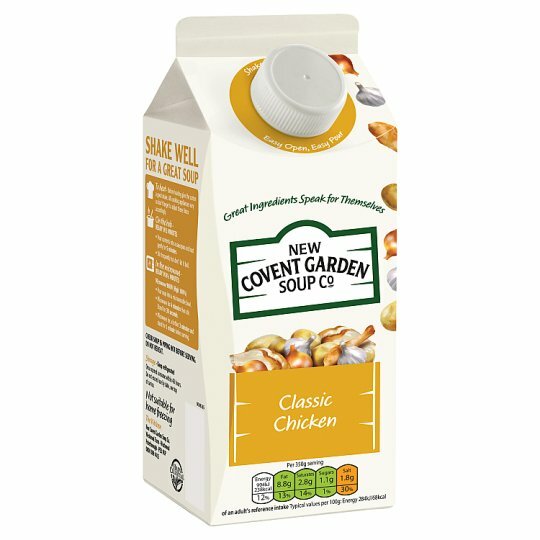 Our indulgent chicken soup will warm your soul and make you feel good. Cream, butter, white wine and black pepper provide the finishing touches to create this silky, rich soup with succulent chicken. When ultimate comfort is required our thick creamy classic chicken soup is sure to deliver. Cooking Instructions (General): Before heating give the carton a good shake. All cooking appliances vary so don't forget to adjust these times accordingly. Hob (From Chilled): Ready in 5 minutes. Pour contents into a saucepan and heat gently for 5 minutes. Stir frequently but don't let it boil. Microwave (From Chilled): Ready in 8 1/2 minutes. Pour soup into a microwavable bowl. Microwave for 4 minutes then stir. Stand for 30 seconds. Microwave for a further 3 minutes and stand for 1 minute before serving.